We had Macaroni and Cheese Casserole for dinner recently and everyone enjoyed it. The addition of ham and peas turns what many consider a side dish into a complete meal. This tasty casserole is a great way to use leftover ham, or you can buy some boneless ham and cut it into workable portions to keep in the freezer. 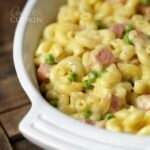 Macaroni and cheese with ham and peas is the perfect comfort food, excellent for a weeknight meal, similar to our amazing Creamy Crockpot Macaroni! I used my Easy Stovetop Macaroni & Cheese recipe for this delicious baked dish. I’ve served this macaroni and cheese casserole both with and without bread crumbs, it’s great either way. Some people like glaze on their meatloaf and some prefer gravy, serve this baked dish however you prefer. RELATED: Try one of our most popular casseroles – John Wayne Casserole! 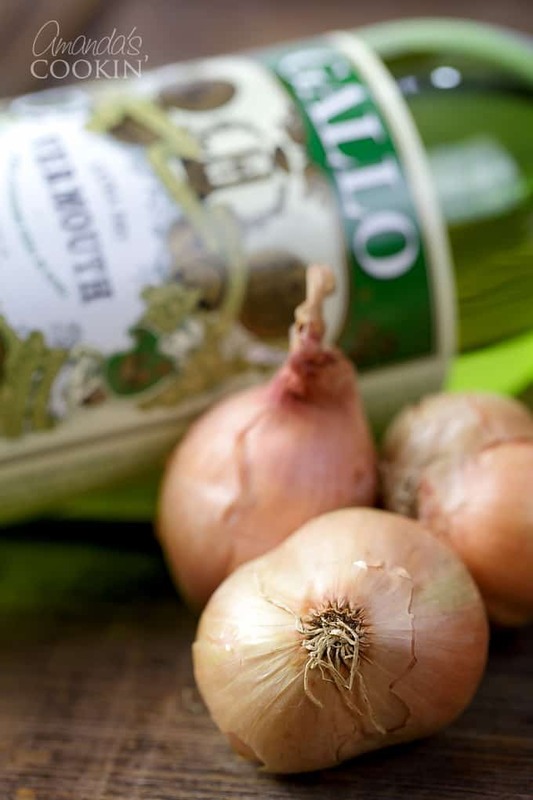 I use vermouth in this recipe, however you can substitute with water or chick broth. Not a fan of peas? Try substituting your favorite vegetable. You will make a roux, which will help thicken the sauce. This recipe calls for traditional elbow macaroni, however you can use whatever pasta makes you happy. While the recipe calls for Panko breadcrumbs, any type of cracker or breadcrumb will work. This macaroni and cheese casserole has been added to our weekly meal rotation. If you try it please let me know in the comments. Hope you enjoy it! Preheat oven to 350 F. Lightly spray or butter a 13×9 baking dish. Heat oil over medium-high heat in a 10-inch skillet. Saute shallots until golden brown, 2 to 3 minutes. Add ham; continue to saute until meat begins to brown, about 2 minutes. Add vermouth and simmer until liquid almost evaporates, about a minute. Add peas and cook a few minutes more. Meanwhile, over low heat melt the butter in a heavy bottomed saucepan. 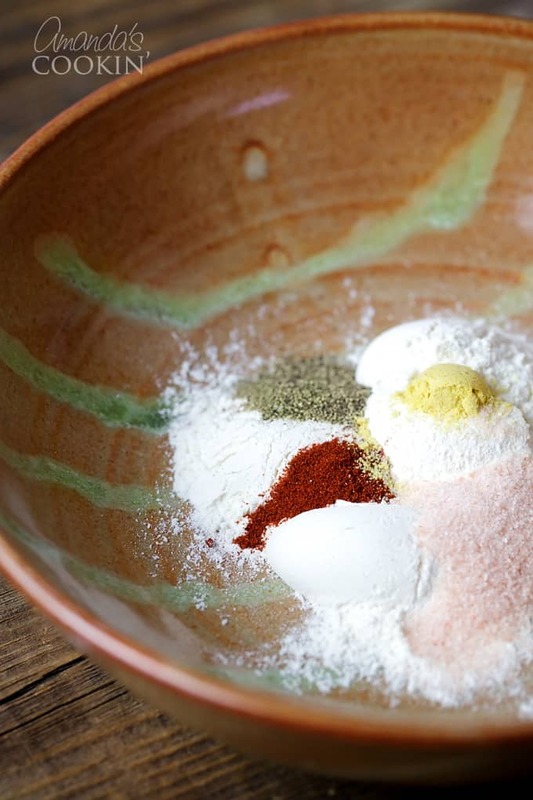 Combine flour, salt, pepper, paprika, and dry mustard. When butter has melted, add the flour mixture to the butter and use a whisk to combine to make your roux. Continue whisking and slowly add the milk, whisking to combine all the ingredients. Turn up the heat slightly and whisking often, thicken the mixture. You may see occasional bubbles, and that’s ok, but you do not want it to boil, just to thicken. When thickened, remove from heat and add the shredded cheeses, using the whisk to combine until melted and homogenous. Drain the macaroni (do not rinse, the starch helps the cheese stick to the noodles) and place in a large bowl. 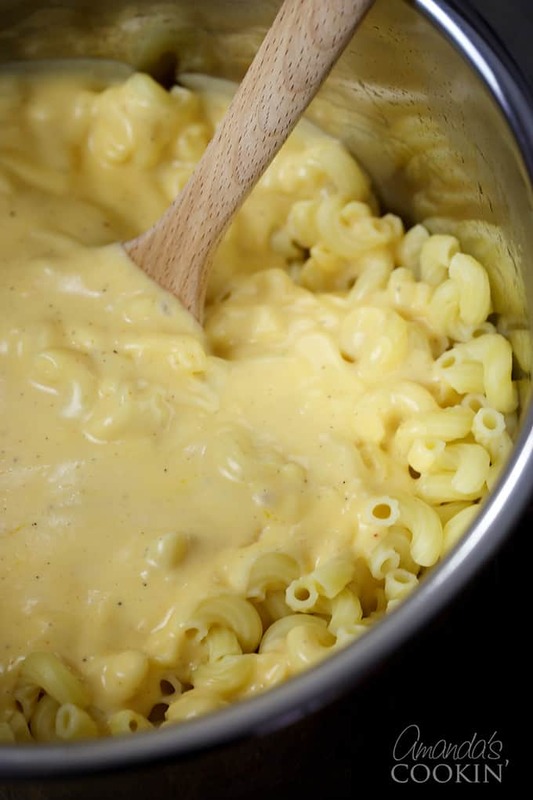 Pour cheese sauce over the macaroni and stir to coat well. Stir shallot and pea mixture into macaroni and cheese. Pour macaroni and cheese mixture into the 13×9 pan and top with the panko bread crumbs. Bake 20 minutes. Its so delicious and mouthwatering. Thanks for sharing. 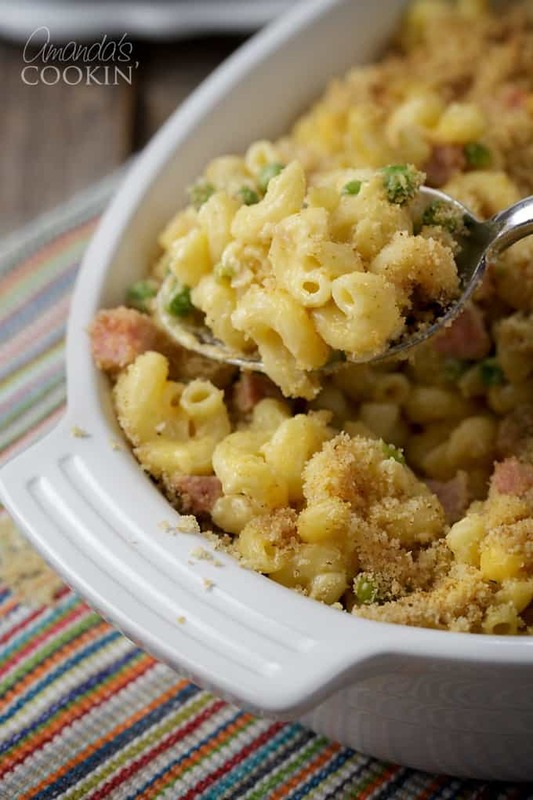 Ham and Pea mac and cheese is one of my favorites! I’m going make this over the weekend! Awesome Joe, hope you like it! thanks! i made the recipe a few months ago and we all LOVED it! can’t wait to make it again! I agree, we’ve made it several time, so glad you enjoyed it! i can’t see the recipe for the ham/shallots/peas mac n cheese. i click the recipe link and it just brings me back to the intro page every time. I love this recipe. 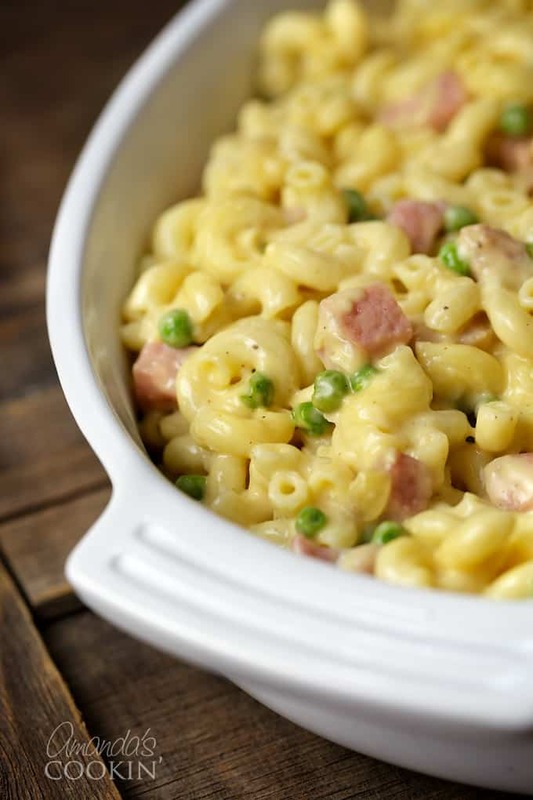 The ham and peas turn normal mac and cheese into a very filling dinner…yum! 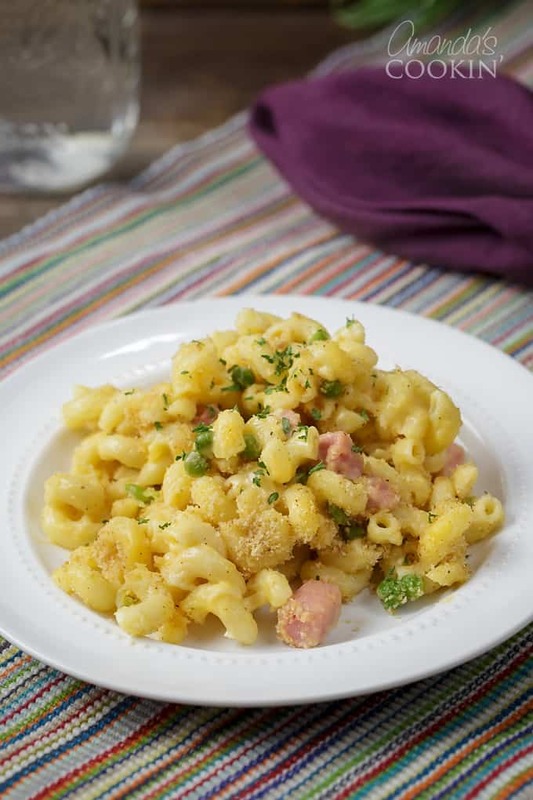 Delicious mac & cheese, sounds wonderful with the addition of ham! I've got the mac in the oven. Can't wait. The boys were excited when I told them I was making homemade mac. I didn't tell them about the peas, they probably won't be too excited when they see the peas, but at least they can pick them out. I love ham in mac n cheese! Looks delicious, Amanda! Looks so super good. love that great topping. Perfect to eat all week.